If Are You Afraid of The Dark had a baby with Law and Order: SVU and ran around doing an impression of The Cell but decided that was only a phase and tried to be The Others instead - well, that baby would be Haunter. Before I go any further, let me just tell you, this is one of the worst movies I've had to sit through in a long time. The gist of the movie is that a dead girl and her family are trapped in their house. If that plot sounds strikingly familiar, it's likely that you (like me) grew up watching Beetlejuice. Don't get too excited because Haunter has none of the charm or humor that Beetlejuice does. It's also possible that you've just been watching American Horror Story (AHS). 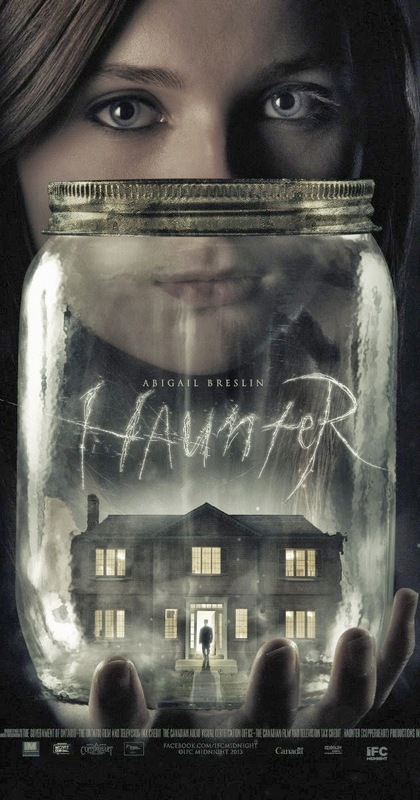 You can get excited by this one, Haunter is as poorly acted and written as AHS. Seriously. The acting was terrible. Even Abigail Breslin (who is typically regarded as a top-notch actress). As things progress, it might seem like there's some Amityville thing going on here but don't believe it - the family was just murdered by an immensely prolific serial killer. Oh. And the ghosts of all his other victims are trapped in the house, too. Yeah - it's a bit crowded in there. There was some serious disconnect between the ideas in the script and what came out in the movie - or I'm willing at assume that, anyway. On paper, the story is not a completely terrible idea but it was so poorly executed that I can hardly forgive the plot holes and illogical dialog. The movie severely lacks focus and even (eventually) refuses to follow it's own inane rules as the story progresses. Things just disintegrate into seemingly random actions and the movie ends in some sappy, Lifetime movie, Hallmark quality ending. I'll pause here to confess, I've never been a fan of the director (Vincento Natali). When Cube came out, there was so much hype in the horror scene about how amazing it was and I'll happily tell you now that I've never liked that movie. And Splice. I've been working on a rant about that movie. I actually didn't know that he directed Haunter (before I watched it) or I may not have watched it. I feel like I've lost focus here myself so I'll just end now. Watch the trailer here and do yourself a favor - don't bother watching the movie!